Prima Princessa was thrilled to see over 700 entries for the contest for our kids ballet show series here. Prima Princessa Series Review: "My girls love the Prima Princessa shows. Just beware, kids will be dancing incessantly after watching! Lots of twirling and 'MOM, I need to put on my tutu!'" Prima Princessa Nutcracker Review: "It was so worth all the anticipation! The young girls twirled in the yard once again. The cartoon fairy explained each scene of the Birmingham Royal Ballet’s performance in age-appropriate language. At intermission, real ballet steps were taught..... It got the little one dancing and laughing and happy." Prima Princessa Nutcracker Review: "Your little dancer will love this wonderful Christmas classic." Prima Princessa Nutcracker Review: "This Dvd was absolutely adorable! My daughter has attended Dance class for both ballet and tap, and she loves to dance. So when I got the chance to review this item, I was very excited! Prima Princessa shares with your little one the story about the nutcracker, and pauses between scenes for you to practice different ballet moves. This is so great for that little dance of yours because not only does it tell a timeless story, it encourages your child to be more active, which is always great." Prima Princessa Ballet for Beginners Review: "While my girls enjoyed the movies, I think they enjoyed this book more. It goes into details the basic positions and tells you how to do them." Prima Princessa Nutcracker Review: "The Prima Princessa collection is a wonderful dvd series that teaches little girls how to dance like a real ballerina!" "It is really well-illustrated with detailed descriptions and pictures and is really helping A learn correct ballet moves. This book would make a great gift for the little ballerina on your gift list! ABCD Diaries gives Prima Princessa's Ballet for Beginners an A+!" Prima Princessa Presents The Nutcracker & Prima Princessa Presents Swan Lake DVDs featured. The DVD was enthusiastically reviewed by Nicole at Opinionated Parent as well as 8 additional reviewers in association with TOP including: Blogless Kendra and bloggers Heather from My Family Loves It, Grace from The Parenting Diaries, CPA Mom, Tara from Tara’s View of the World, Christine from Dates to Diapers, Candice from Sometimes Can Can and Lisa from Q T Pies. "Like the previous DVD this really engages children and they can’t help but get up and join in. 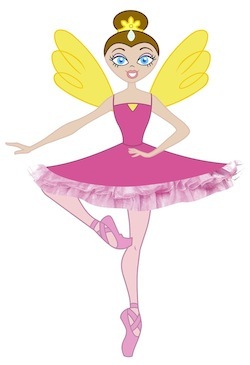 Beth will watch for a few minutes and when the other little ballerina’s appear in their fairy wings and dress I just hear a “oh … my fairy outfit” and she reappears from the dressing up box with her fairy wings and skirt ready to join in." "The DVD targets viewers aged 3-7 and Pierre and Juliette, right in the target age range, did really enjoy watching real children their age on a trip to the ballet and joining in copying the moves, but even big sister Sophie and the Madhouse grown-ups enjoyed watching to find out more about the ballet." In it you can enjoy the Birmingham Royal Ballet performing excerpts from The Nutcracker, narrated for children by a cartoon fairy-ballerina. Your kids can dance along to fun ballet step demonstrations featuring students from the School of American Ballet, the official academy of the New York City Ballet. "We've watched several times in the couple of weeks we've had it and each time Missy insists on dressing up like a ballerina and even requested some ballet shoes for her 3rd birthday last week." Boo Roo and Tigger Too! Independently produced by 2 mums, Prima Princessa Presents Sleeping Beauty contains an entertaining mix of live ballet and ballet step demonstrations young viewers can dance along to. Prima Princessa Presents The Nutcracker, a DVD for young children ages 3-6, has just been released in the United Kingdom for the Christmas 2012. Enjoy the Birmingham Royal Ballet performing excerpts from The Nutcracker, narrated especially for children by a cartoon fairy-ballerina. Dance along to fun ballet step demonstrations featuring students from the School of American Ballet, the official academy of the New York City Ballet. Created by 2 ballet-loving mums from the USA, this show appears annually on American public television during the Christmas season. It can now be found on Amazon.UK for £5.99. "My five year old daughter could not wait to put the DVD on. She loves ballerinas and only the other week she brought home a book about ballerinas. She told me she was going to watch it once properly and then watch it again so she can dance the same as the ballerinas and then ran upstairs....."
Copyright © 2009 Prima Princessa Productions, LLC. All rights reserved.